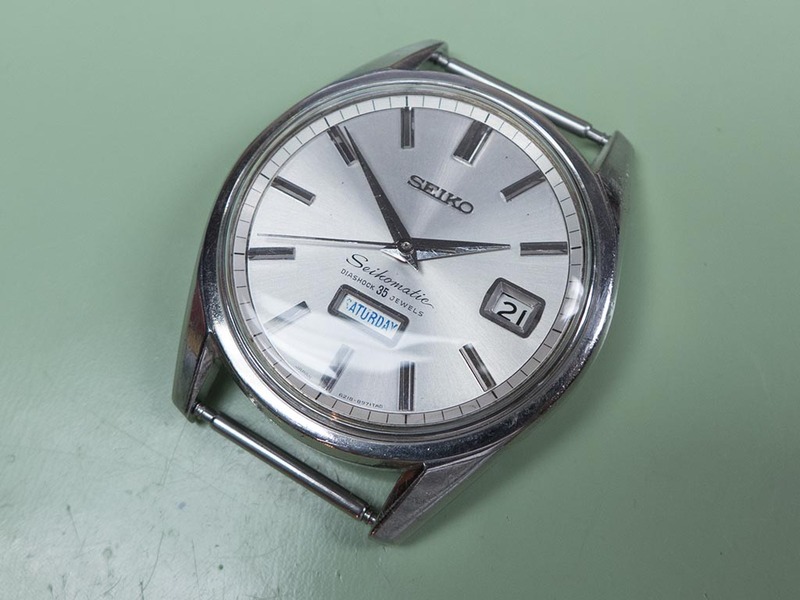 At the time of its introduction in 1964 the 6218-8971 Seikomatic Weekdater was the top of the range flagship of the Seiko automatic lineup. 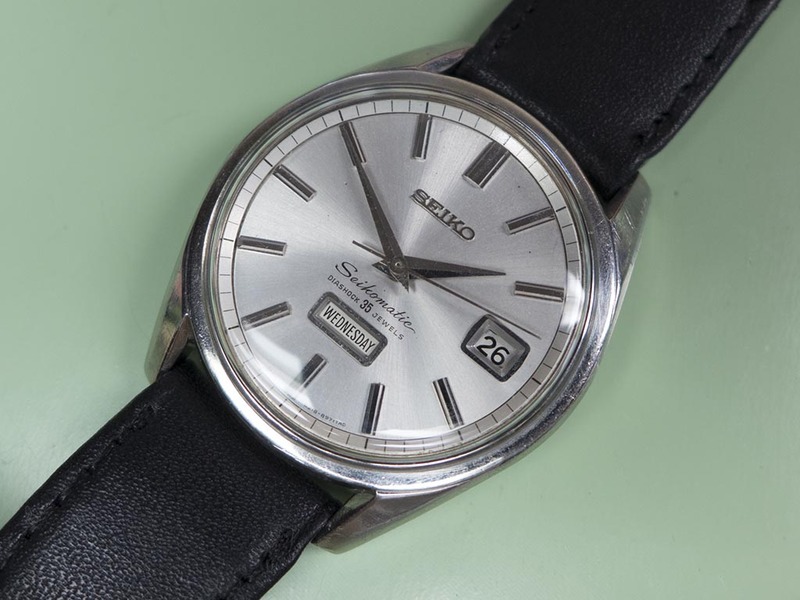 The 1964 Weekdater was the immediate, automatic equivalent of the 1964 Grand Seiko hand-wind, before the appearance of the first automatic GS in 1967. 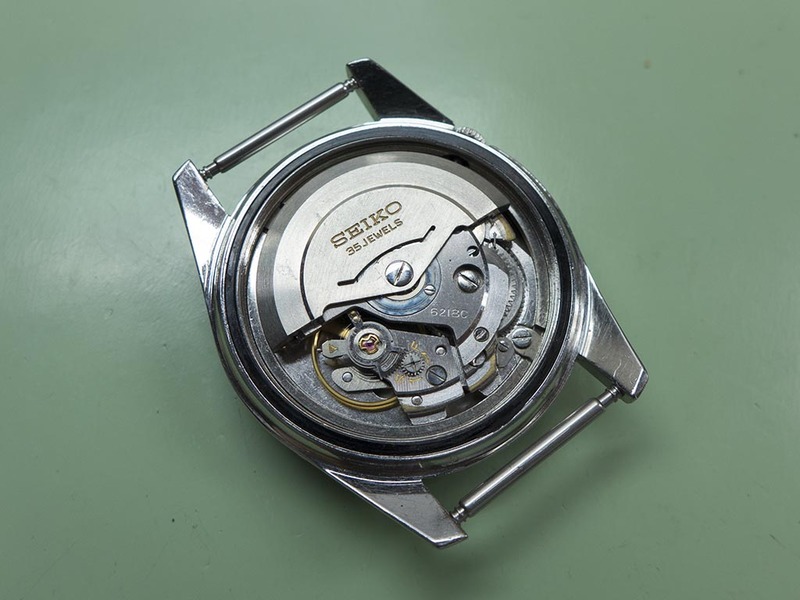 The 6218 movement’s an automatic, 35 jewel, 18,000bph, hacking calibre based on the 62xx platform that powered everything from Seikos World Time and their first dive watch, through to the Grand Seikos of the era. 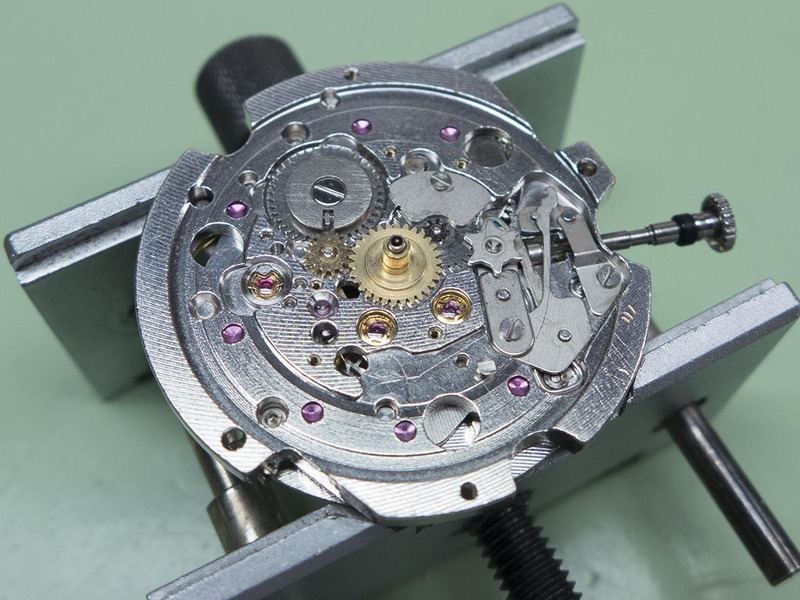 Both the 57GS/43999, 6218 and 62GS have 35 or 39 jewel movements and are all examples where jewels were added to stop what has been translated from the Japanese as the ‘shake fall problem’ with the datewheel. 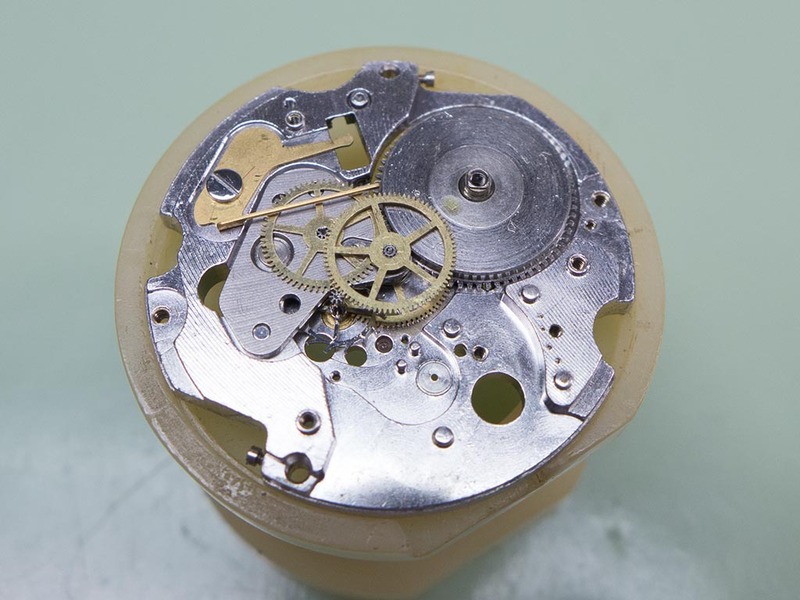 The 1965 example featured below came in for a movement service and is in lovely original condition. 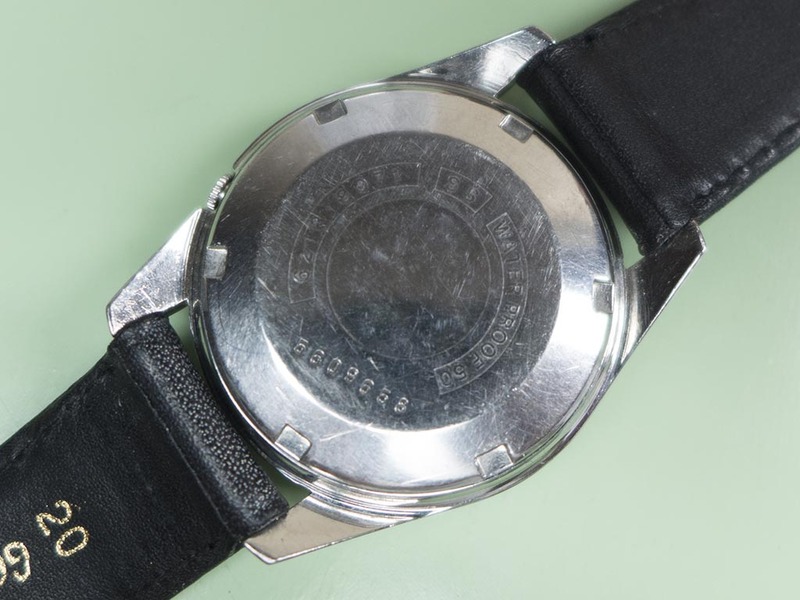 The caseback on this example is plain apart from the reference and waterproof script and the serial number. 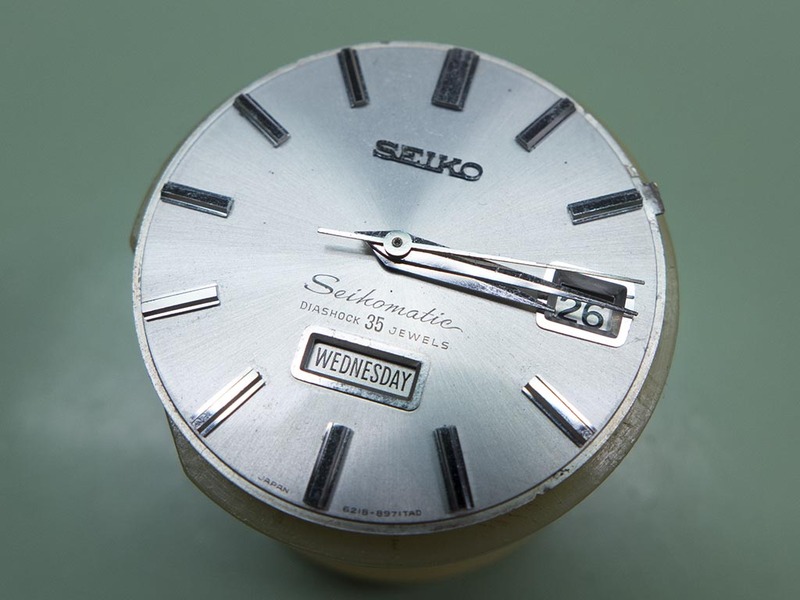 However, Seikos of this era are renowned for the variety of designs that featured on their caseback, anything from sealions, seahorses, dolphins, olympic flames and even crowns! 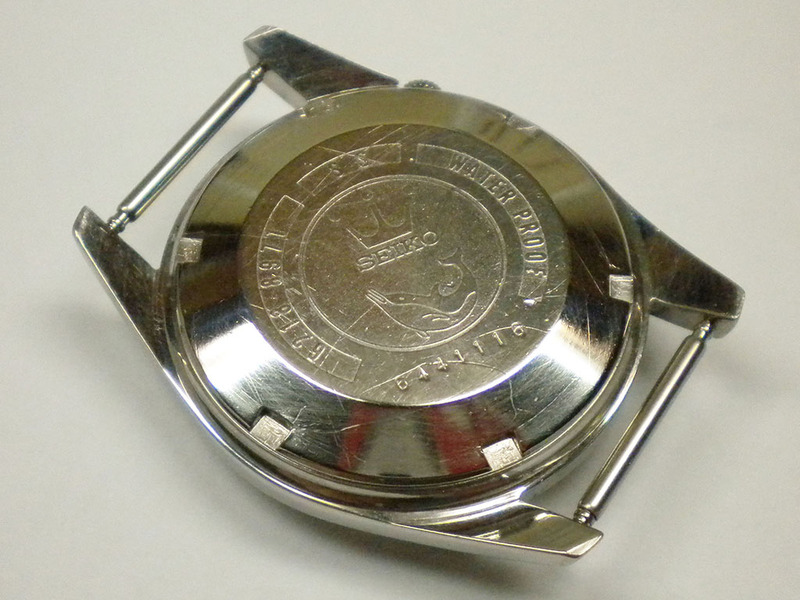 I have exactly the same model as this in my own collection which has a crown and dolphin on the back. 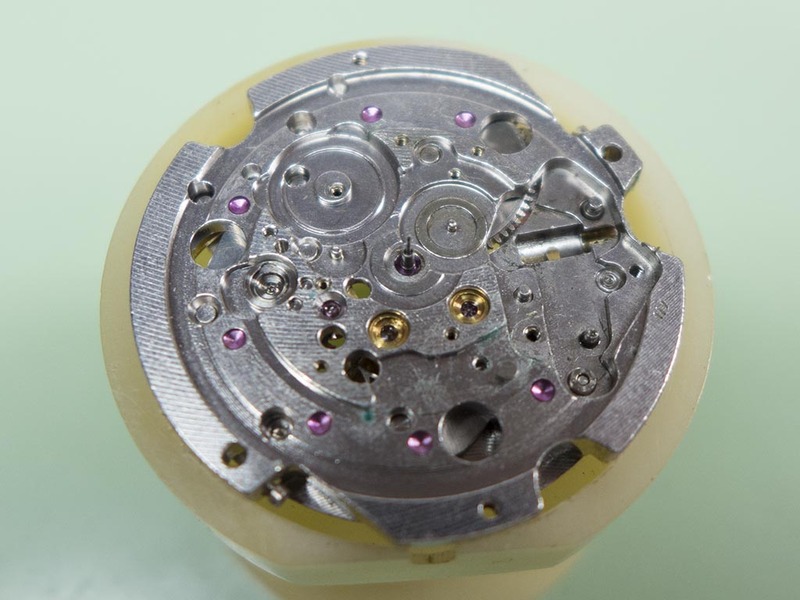 With the caseback removed the 35 jewel movement is on display, note the fine adjuster on the balance regulation. 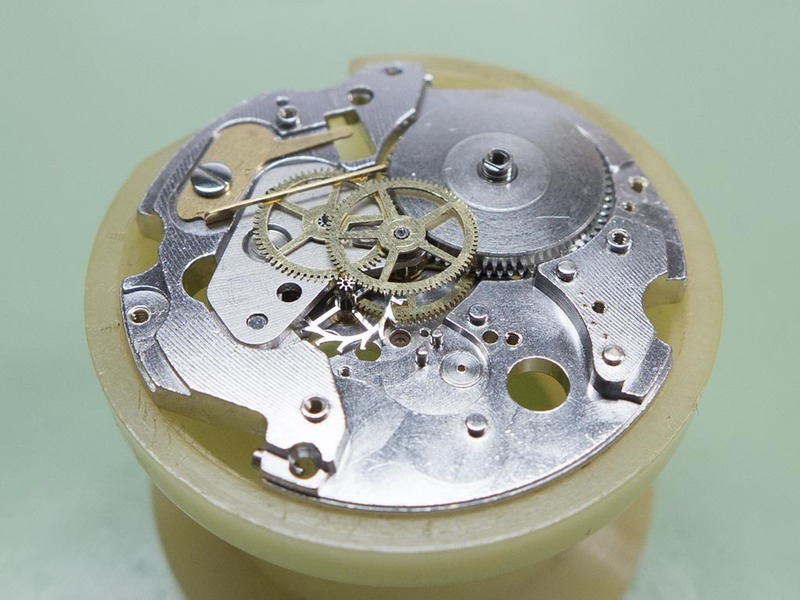 The movement didn’t appear to be in too bad a condition, a little grubby maybe but everything was present. 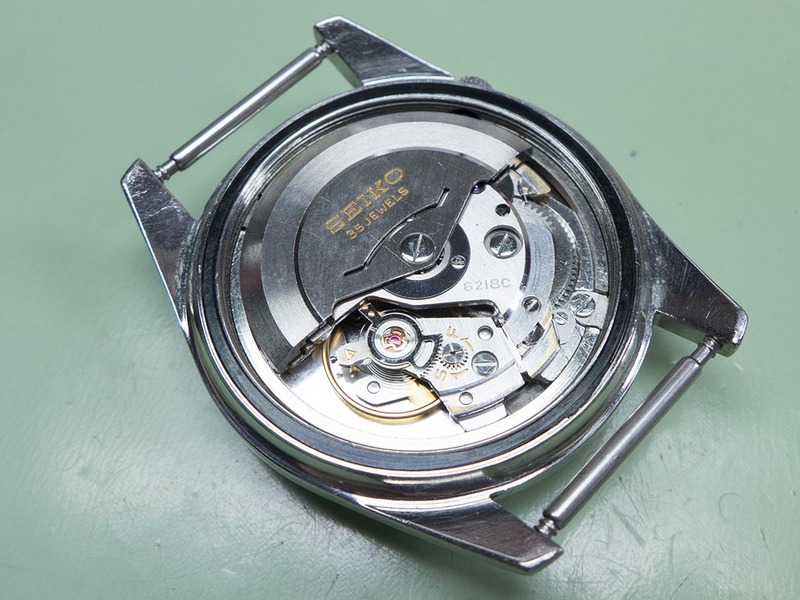 With the movement removed the dial was in particularly good condition for 50 years old, a little grubby again but not much damage at all. 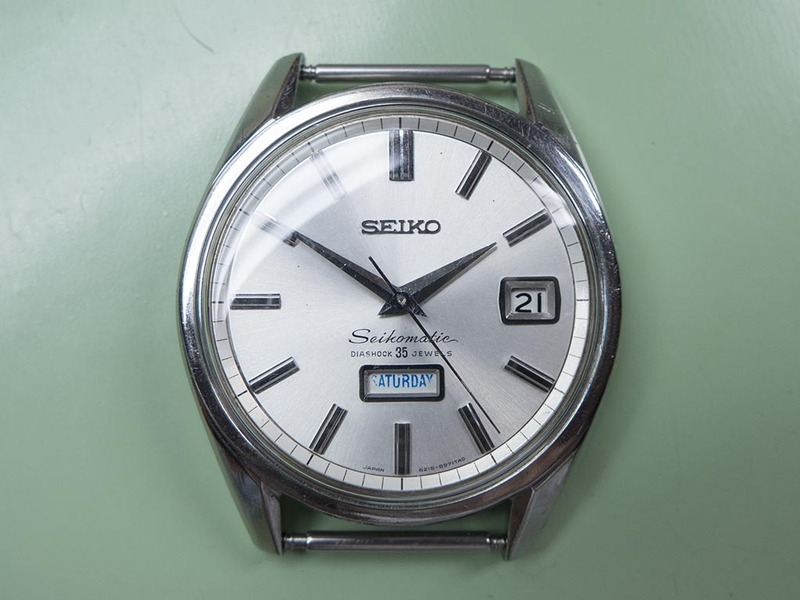 I love the fonts used by Seiko during the sixties. 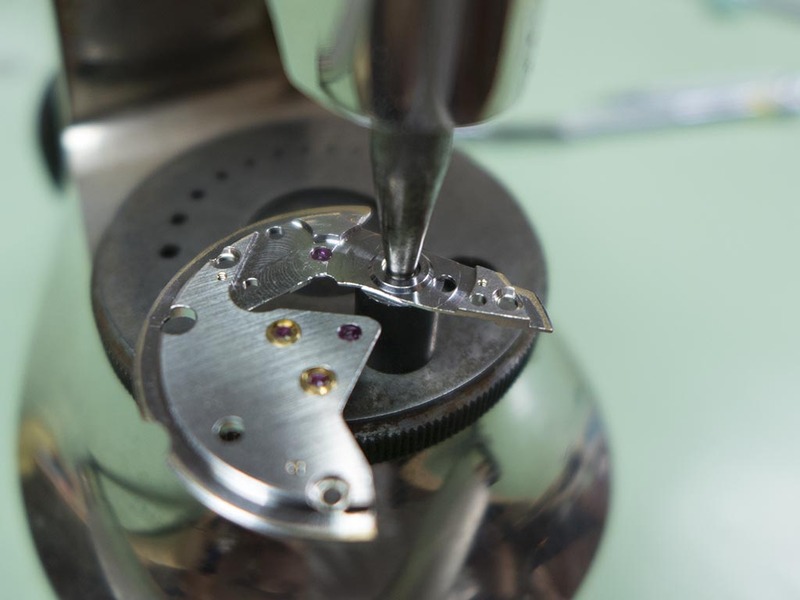 And with the day wheel removed you can see some of the extra jewels that were used for it to slide on. 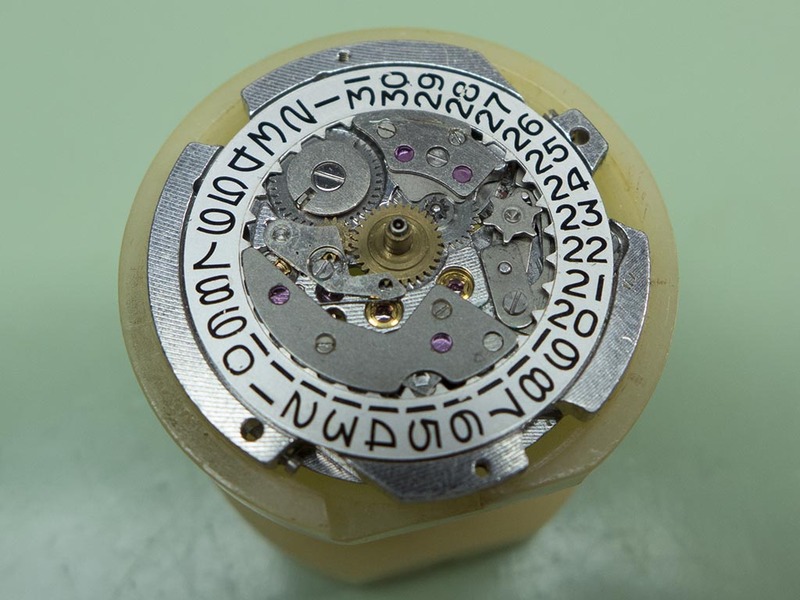 With the date wheel removed a furher seven jewels are utilised for it to rotate on! 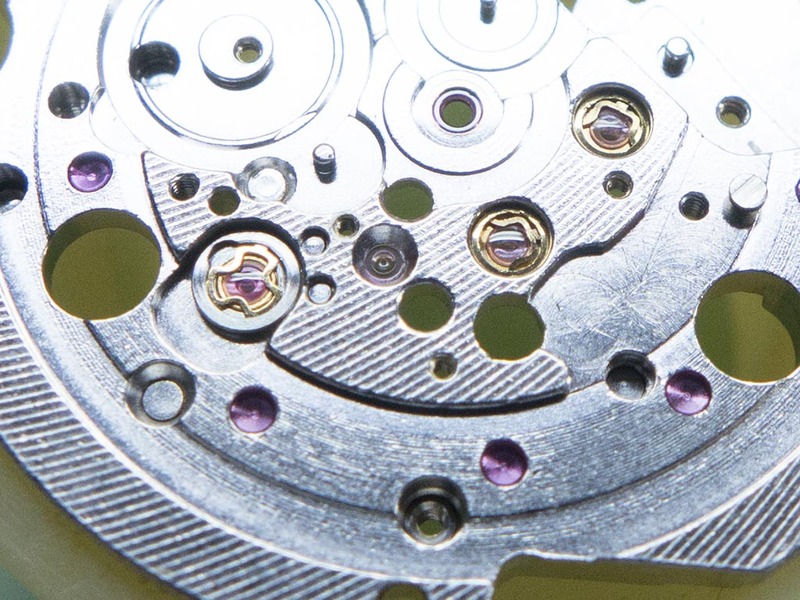 With the motion work being stripped, you can see the brass hacking lever in this shot. 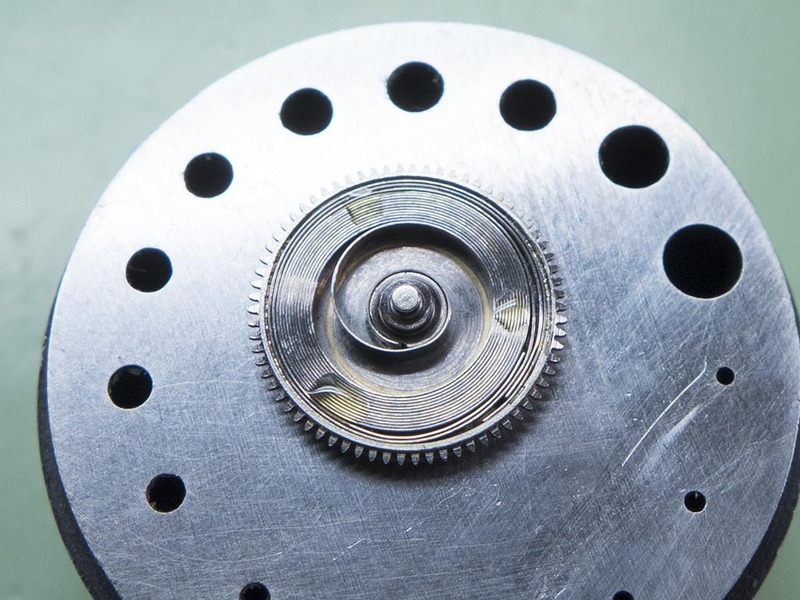 With the plate stripped you can see the barrel arbor bush has been stamped to take up wear. 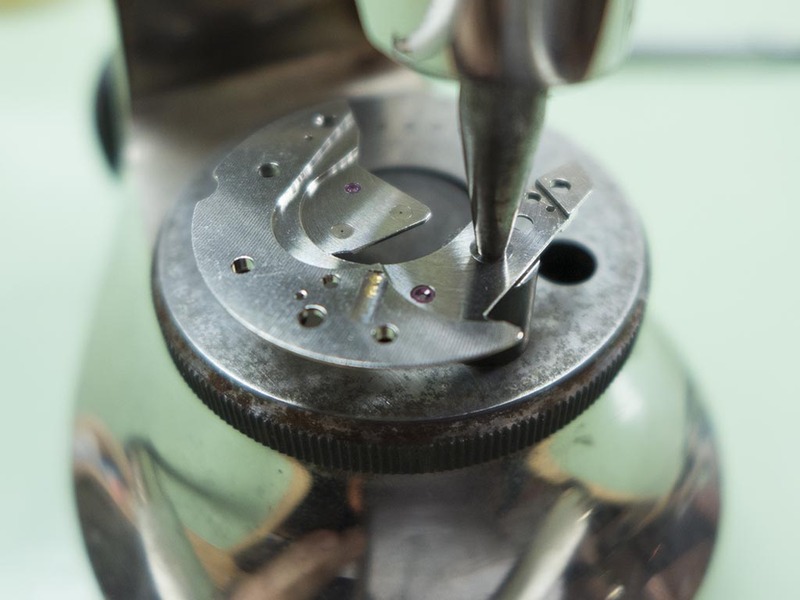 This procedure spreads the metal then it’s broached back to the correct size to reduce play in the arbor. 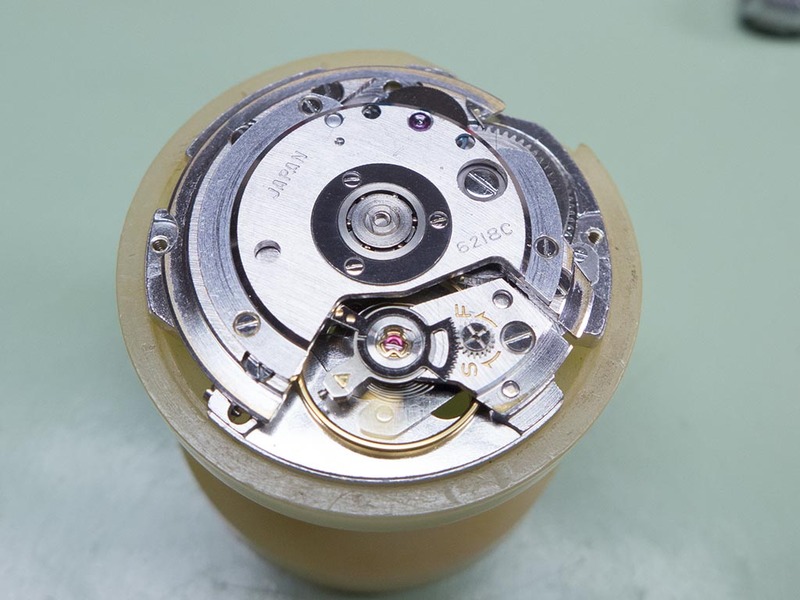 The movement was fully stripped ready for cleaning and inspection. 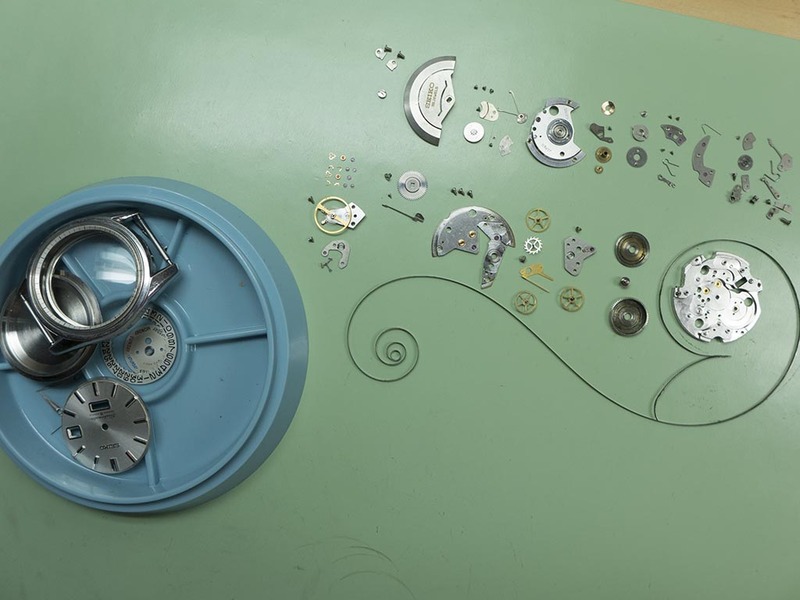 Reassembly started with the mainspring as usual. 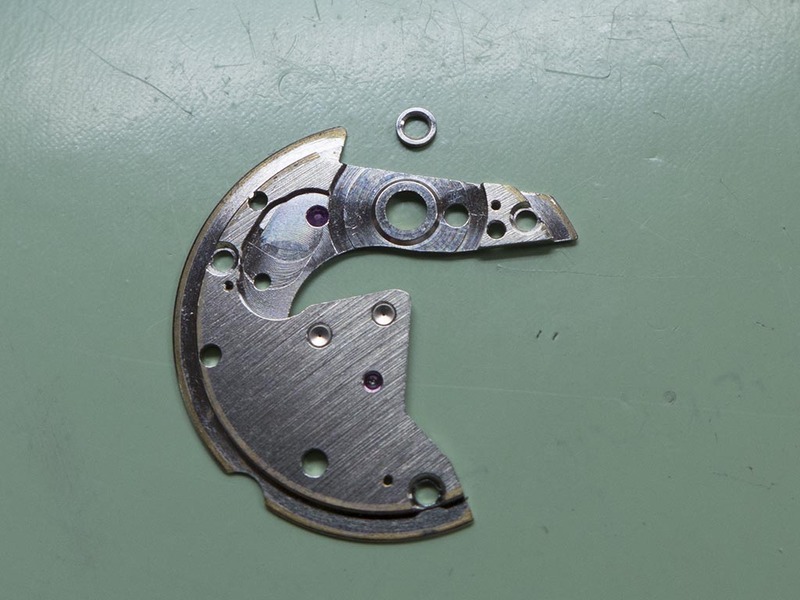 The arbor appeared to have been replaced at some point, probably when the mainplate was stamped and broached. 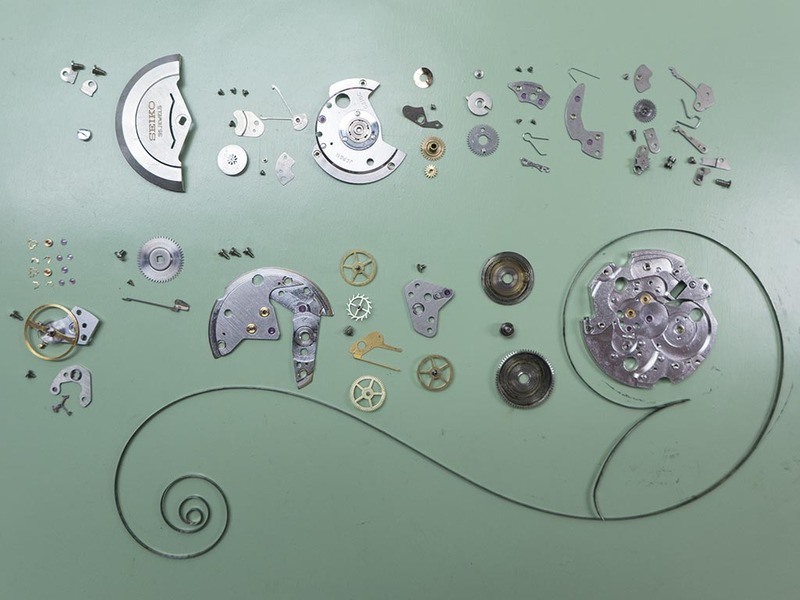 The diashock (balance) and diafix (escape and third wheel) jewels and springs were refitted. 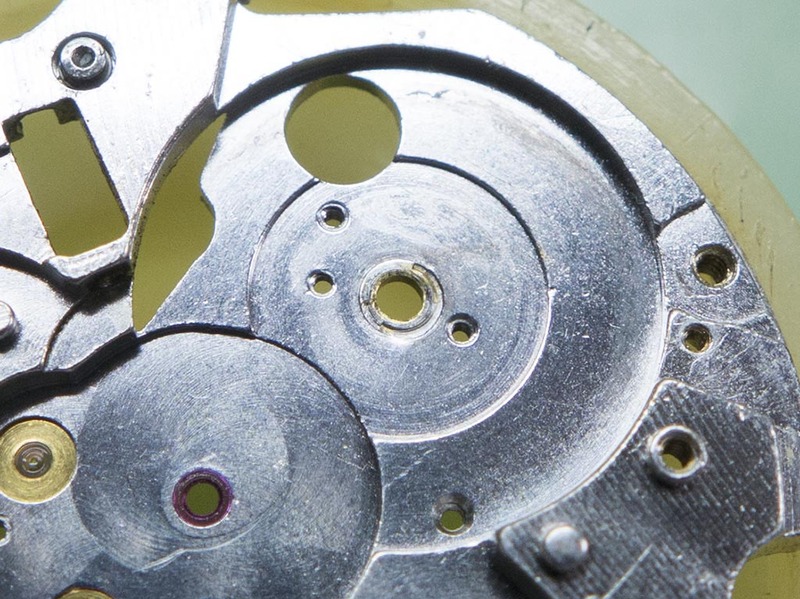 The diafix springs are notoriously fiddly to get back in and if they spring out they’ll never be found again! The train coming back together. One problem that needed addressing was the arbor bottom bush, there was quite a bit of play present and as I mentioned the arbor itself looked to have been replaced at some point so the bush needed replacing. I had a good one from an old plate in the spares drawer so I pressed out the bush. 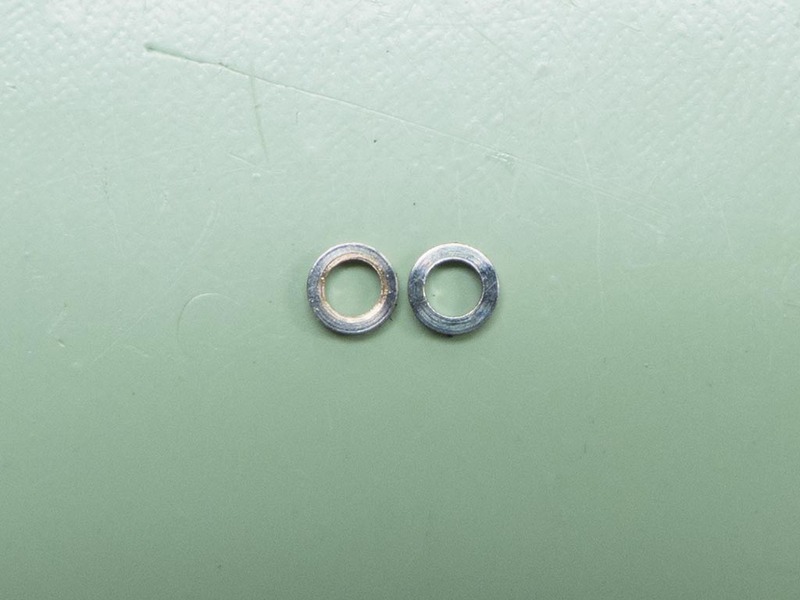 You can see this plate is from a “lesser” model as there is no diafix jewels added, in fact it was from a 6205 calibre. You can visibly see the bushes wear in this comparison shot. The replacement bush was pressed home. And the motion work was finished off. 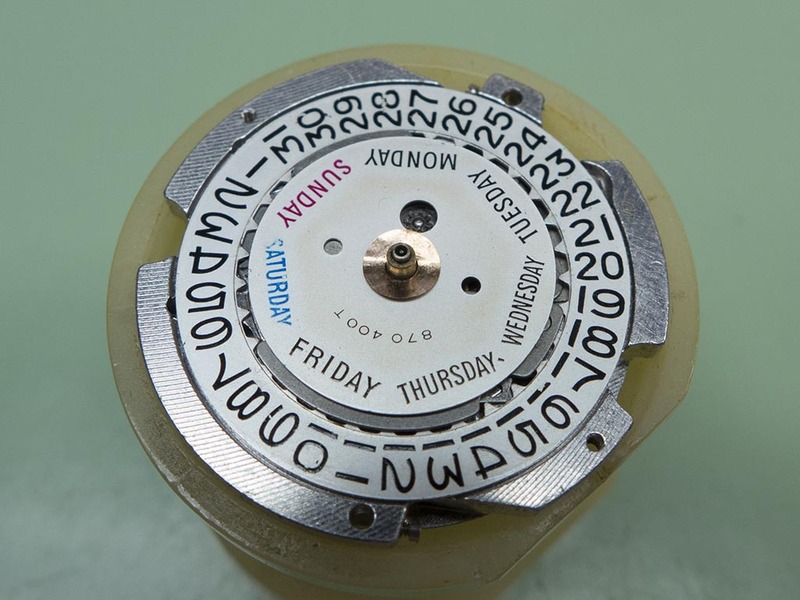 The calendar side was reassembled, the clutch and date corrector were in great shape, usually these are shot by the time they reach me! 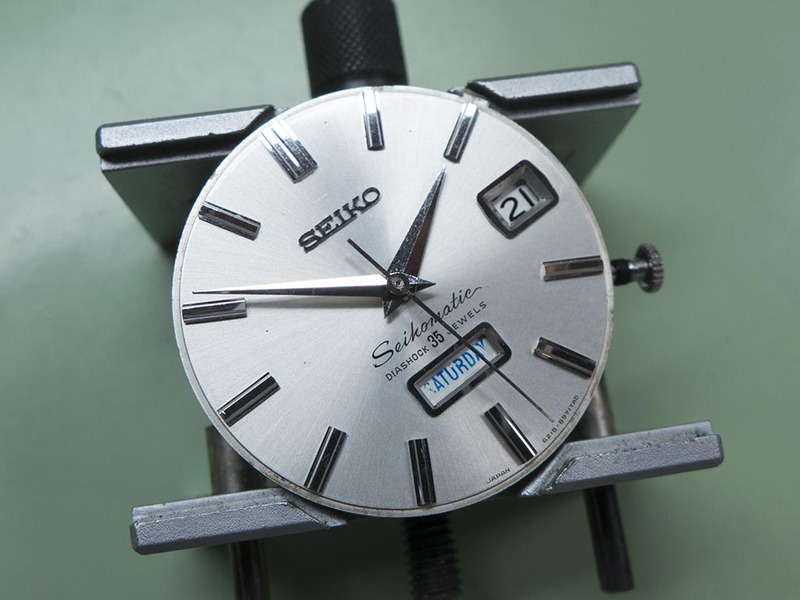 The cleaned dial and handset was refitted. The casebcak replaced and she was finished. 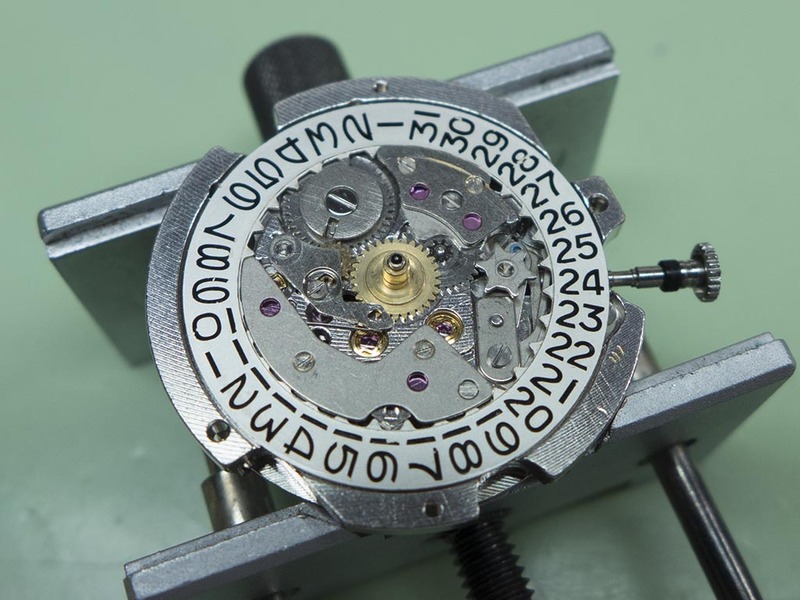 I love the look of these 6218’s, everything about them is just right, the way the watch has a narrow bezel which accentuates the dial, the graduated chapter ring, the beautiful fonts used, the split date and day window and the dauphine type hands. 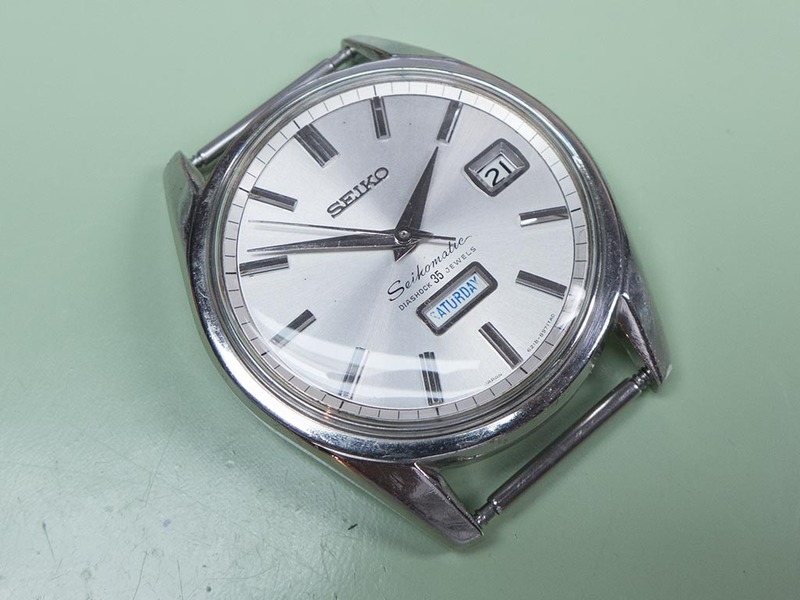 They aren’t the easiest watches to source, I spent years looking for my example!